You can either browse or choose your own Brand / Colours or Contact us to design something custom made for your needs. The possibilities are endless. Whichever design you choose, we will make your leavers hoodies to the highest quality. We have been providing school leavers hoodies for close to a decade. With our years of experience we are confident we offer the absolute best price and quality mix available for custom collegiate style clothing. 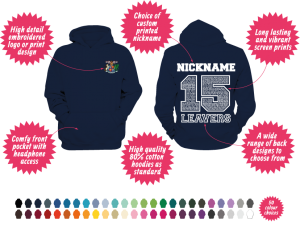 Leavers Hoodies are the perfect memento of your time at school, college and university. We offer a huge number of styles, colours and garment choices. Our wide-range of options and our talented in-house design team mean we are uniquely positioned to provide high quality products that are truly unique and personal to each customer. All our leavers hoodies, leavers sweatshirts and other garments are printed and embroidered in our building in the UK and manufactured to the highest standard. So, you can order with confidence that we will provide products made to last. Our aim is to deliver clothing that you will be just as proud to wear at a class reunion many years down the line as you are on your leavers or graduation day.